This blog post begins a series examining the risks and returns of private equity investments. 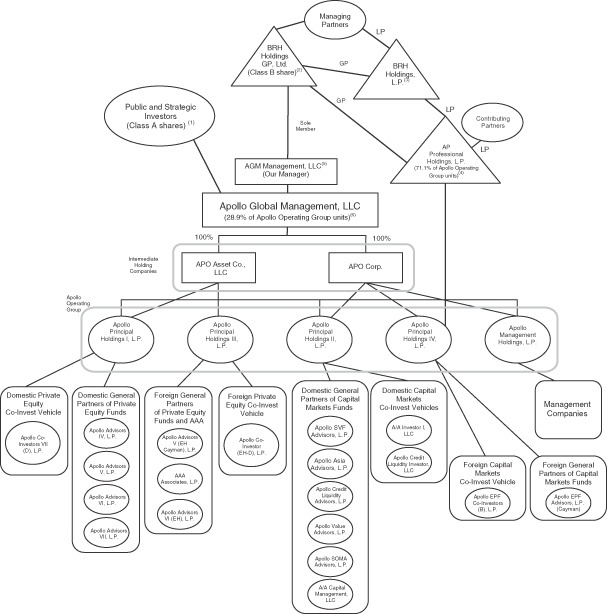 Apollo Group Structure: Got it? On July 28, 2017, Apollo Group Management LLC announced the largest ever capital raise for a private equity fund. While this $23.5B fund will be the largest ever, it may not hold the title for long. The New York Times reports there are two other private equity funds in raises with higher targets. While these capital raises are impressive, they also raise questions. As the private equity space has become increasingly crowded, returns have declined. Industry statistics are sobering. Likewise, median net multiples have declined from around two to around one over the same time period. The reduction in returns has led to a number of abusive practices at private equity funds. These abuses were highlighted by the SEC in a high-profile campaign in 2015. However, the continued bull market has helped to keep valuations high and has served to reduce litigation. This will not always be the case. When the market turns, successful exits will become harder to realize and this will depress IRRs. At that point, private equity funds and the advisors who sold them may find themselves in the difficult position of having to justify total fund expenses that can amount to six percent of committed capital, annually. While private equity remains a legitimate asset class, a tremendous amount of diligence must be conducted in order to insure that abusive practices are not being utilized by funds at the expense of their limited partners. I will give an overview of some areas that disserve heightened diligence and then explore them in later blog posts. Diligence into private equity funds is a time-consuming and laborious process. Most investors are not equipped to undertake this due diligence as the private placement memorandums are written in legalese and encompass concepts from finance, economics, accounting, and law. This is a form of complexity risk, something I have written about extensively. Indeed, because of their complexity, many professionals are ill-equipped to properly evaluate private equity investments. An example of private equity complexity risk can be seen at CalPERS, the massive California Pension manager. CalPERS endured public embarrassment in 2015 when it had to admit it could not account for the fees being paid to the pension's private equity fund managers. This fact is even more remarkable in context of CalPERS’ investment staff of nearly 400. Advisors must have extensive training and experience with private equity investments before they can undertake the rigorous due diligence required to make a suitability determination. I will examine these and other factors of private equity risk and return, as well as their implications for suitability and supervision, in subsequent blog posts. Tom Buerkle, “Apollo’s Huge Buyout Fund Provides for a Large Margin of Error”, New York Time’s; June 28,2017. Available at: https://www.nytimes.com/2017/06/28/business/dealbook/apollo-global-management-buyout-fund.html; Accessed November 16, 2017. Prequin 2017 Global Private Equity and Venture Capital Report. Available at: www.prequin.com; Accessed November 16, 2017. SEC Announces Enforcement Results for FY 2015; October 22, 2015. Available at: https://www.sec.gov/news/pressrelease/2015-245.html; Accessed November 16, 2017. Randy Diamond; “CalPERS CIO looking at possible drastic cuts to private equity, citing transparency”; Pensions & Investments; June 19, 2017. Available at: http://www.pionline.com/article/20170619/ONLINE/170619871/calpers-cio-looking-at-possible-drastic-cuts-to-private-equity-citing-transparency?newsletter=investments-digest&issue=20170619; Accessed November 16, 2017. CalPERS biography of Ted Eliopoulos, Chief Investment Officer. Available at: http://www.pionline.com/article/20170619/ONLINE/170619871/calpers-cio-looking-at-possible-drastic-cuts-to-private-equity-citing-transparency?newsletter=investments-digest&issue=20170619; Accessed November 16, 2017.